The perfect addition to any superyacht's tender and toy collection, the Kennedy family's sailing dinghy is up for auction. Named Scallop, the sailing dinghy was painted to be the colours of a Greek shipping boat. Jacqueline Kennedy Onassis commissioned this boat shortly after her marriage to Aristotle Onassis, and the boat was shipped overseas to Greece so her children, John Jr and Caroline Kennedy, could sail in the same type of boat that was used for sailing lessons at the Kennedy compound in Hyannis Port, Massachusetts. Jackie O later sold it to an Hyannis Port family called the Gallaghers, and Peter Eastman purchased it from them in the early 2000s. Now John Jr and Caroline Kennedy’s childhood sailing dinghy will be available at a live auction in Boston, hosted by Remarkable Rarities auctions. 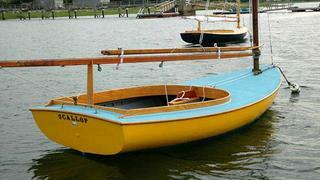 The dinghy has been restored to its original colours with a bright sky blue deck and a bright yellow hull, which wasn't seen until the boat was stripped down. An original letter from Caroline Kennedy confirms this paint job. Bronze letters on the transom bear the name Scallop, as she was christened by the Kennedy family. What happens to it next is up for grabs as the bidding begins today, 12 February, and runs until 18 February, followed by the live auction February 19 at the Royal Sonesta Hotel in Cambridge, Massachusetts. Other Kennedy family collectibles available at the auction include: a John and Robert Kennedy signed photograph taken in the Oval Office; Jacqueline Kennedy’s Delman linen shoes from her Georgetown closet; a White House wallpaper swatch removed by Jackie Kennedy during renovation; Kennedy wedding china and silverware collection used at their extravagant Newport reception. Nothing that tops a sailing yacht though. While many large yachts can carry a pair of sunfish or a wooden sailing dinghy, this is a coveted collector's item for the sailor and history enthusiast.